NORFOLK, VA – On Wednesday, January 23, 2019, the City of Norfolk, Virginia, sold $133,695,000 in General Obligation (G.O.) Capital Improvement Bonds on a competitive basis using Grant Street’s MuniAuction online open auction platform. Bank of America Merrill Lynch won the bonds submitting the bid with the lowest True Interest Cost (“TIC”) of 3.51%. During the auction, 8 competing banks – or “underwriters” – submitted a total of 22 bids. Each time an underwriter submitted a bid, it and all other underwriters who had previously submitted a bid instantaneously learned their rank. Underwriters then had the option to either hold or improve their bid in an effort to win the City’s G.O. Bonds. As set forth in the bidding rules, the initial bid period was extended to allow the winning bidder to hold the lead position for two minutes. This enhanced competitive process resulted in the City achieving a low borrowing cost and City officials, as well as their counsel and financial advisor were able to watch open auction bidding in real time. Between the initial bid submitted and the final bid submitted by Bank of America Merrill Lynch, the City’s total interest cost decreased by $4.35 million. The strong demand for the City’s G.O. 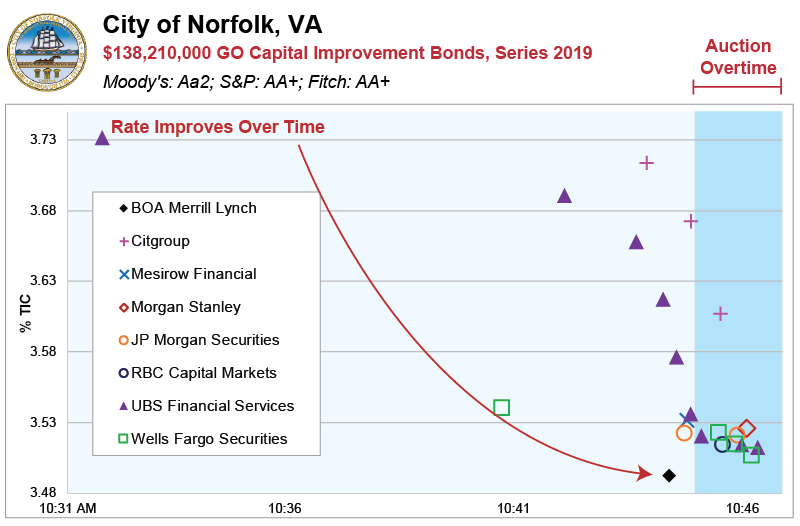 Bonds reflects the strength of the City’s underlying credit ratings, which are Aa2, AA (positive outlook), AA from Moody’s Investors Service, Standard & Poor’s, and Fitch Ratings, respectively.